For shipping to EU contact us. Write a review | Ask a question ? The new Promethean ActivPanel Touch transforms the traditional “front-of-the-classroom” interactive display into a collaborative learning centre where multiple students can simultaneously share ideas, practice team-based problem solving, manipulate images and edit digital content. The 84" ActivPanel from Promethean boasts a 4K Ultra High Definition screen with 10 points of touch, a toughened 4mm acid etched, anti-glare and anti-reflective, toughened glass surface. 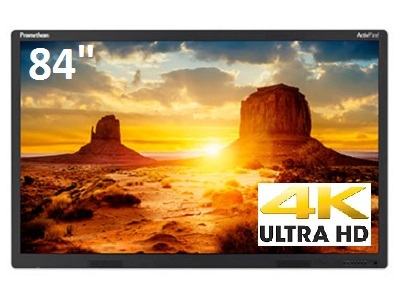 The 84" Atciv Panel come complete with integrated speakers along with multiple VGA & HDMI Connections making the Activpanel a class leader. ActivPanel Touch promotes active participation in whole-class or small-group lessons by providing vivid interactivity and engaging learning experiences. Promethean’s award-winning ActivInspire Professional Edition software and access to Promethean Planet’s 90,000+ free teaching resources and online professional development provide educators tools and support for active and inspired learning. With ActivInspire, teachers transform traditional, lecture-based classrooms into learning environments infused with imaginative, interactive experiences that captivate students’ attention while granting them the freedom to take ownership of their achievement. Designed to foster collaboration and active learning, ActivInspire empowers teachers to blend real-time assessment and real-world experience into the learning process. ActivInspire integrates dual-user pen and multi-touch functionality* and Promethean’s award-winning student response systems to support collaborative teamwork and ongoing assessment in the classroom. With access to premium content, including assessment templates and unlimited visual and auditory resources, ActivInspire provides you with all the building blocks you need to create differentiated lessons filled with rich, hands-on activities in a fraction of the time. > Why ActivInspire? Increase collaboration Dual-user input* and pen and multi-touch functionality encourage students to engage, interact and work together during lessons, resulting in communication-building teamwork. Enhance classroom efficiency Deliver more effective lessons with fully functional, integrated tools like Revealer and Spotlight focus tools, Magic Ink, Clock and Math Tools. Simplify lesson preparation and delivery ActivInspire’s intuitive interface allows teachers to easily create lessons, enhance collaboration and engage students through interactive tools. Discover timesaving resources With curriculum-based templates and an assortment of tools, images and activities, ActivInspire provides you with all the building blocks you need to create an interactive learning environment. Connect with Promethean Planet, one of the world’s largest online educator communities, to discover a wide variety of free resources for use in the classroom. Key Features Dual interface—Easily switch between Primary for young learners and Studio for older students. Support for mathematical equations—Use the Equation Editor to add mathematical equations into a flipchart or into questions or response options for ActivExpression learner response devices. Cross-platform and flexible—Compatible with Windows, Mac and Linux and can be used with most any interactive display. Embedded web browser—Stream content and data directly from websites into flipcharts, rather than downloading it and storing locally. Import-friendly—Integrate files and content from a variety of other applications, such as Microsoft® PowerPoint®, Adobe® and Smart Notebook™. Extensive customisation features—Create a profile to suit your teaching style and lesson requirements. Dual-user functionality—Two users can interact simultaneously anywhere on many ActivBoard models, promoting collaboration. Easily share—Access the Send as Email feature to attach a flipchart to email from within ActivInspire. We have access to demonstration products and loan units, AV Installs can arrange for the screen to be demonstrated at your premises or you can come in and see it in our new demo suite. Please call us on 01604 493755 to book a free of charge demonstration! 10-point touch and gesture control. Dual touch input allows 2 independant PC’s with touch. There are currently not any question about this product. Ask us question online ?